Could this be a little bit of beauty sleep in a bottle? 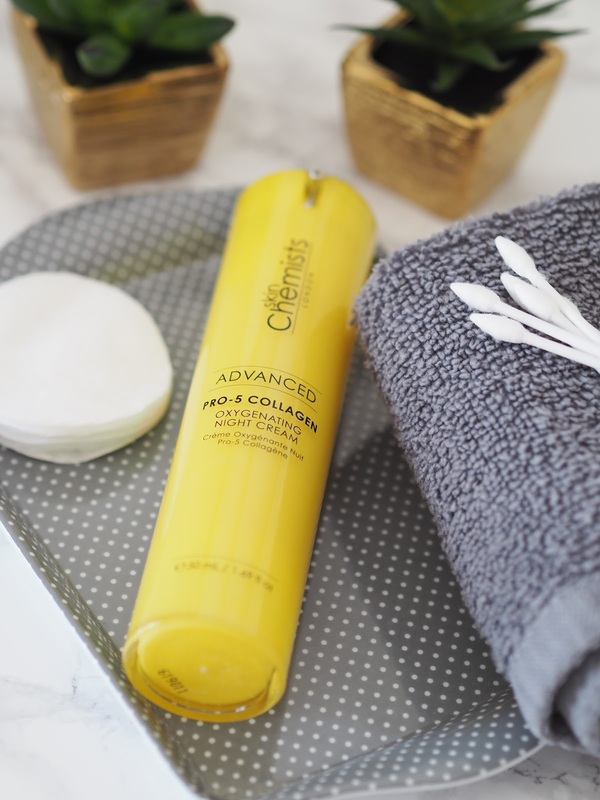 Part of the Advanced Pro-5 collagen range, this oxygenating night cream aims to give your skin a helping hand whilst you dream away and let's face it (pardon the pun) who doesn't want a product that's going to work hard for you whilst you're off in the land of nod?! 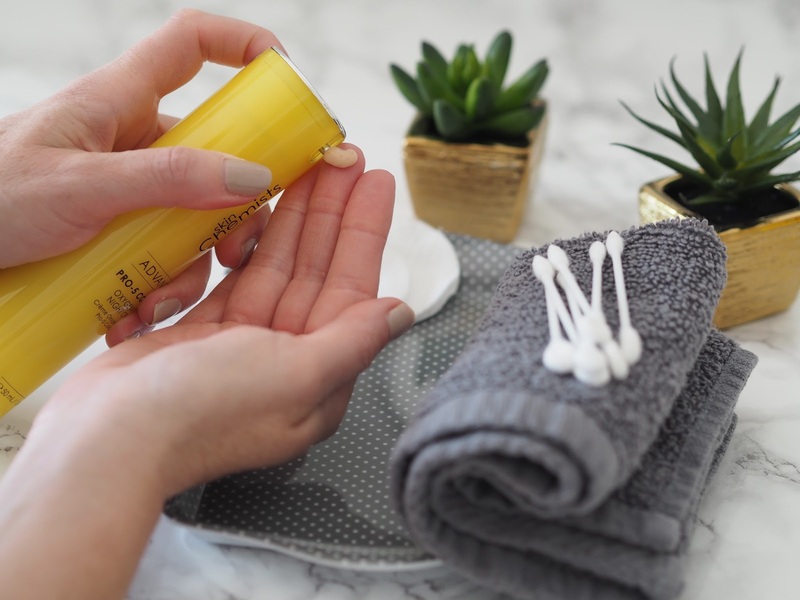 Each month I bring you a product from British skincare brand, SkinChemists, and I've been using this for a couple of weeks now. Packed full of active ingredients, it aims to boost elasticity and even tone, leaving your skin revived and with long term use, a more youthful appearance. Marine collagen to help leave the skin smooth and supple. Gatuline Bio works to help promote skin health and regeneration, visibly reducing wrinkles by renewing dull or ageing skin and providing hydration. Matrixyl 3000 helps to smooth away visible wrinkles and blemishes. Now, I've heard of Matrixyl and I'm no expert but I know that's it's bloody good for your skin. Matrixyl is a peptide and it helps to stimulate collagen synthesis and skin repair. Matrixyl 3000 however is made up of two new peptides and is supposedly better than the original Matrixyl so it's good to look out for products containing this active ingredient. The cream itself is a nice consistency, very light actually, not what you'd expect from a night cream in general, a lot of them are thicker, and a lot richer. Don't be fooled though into thinking you need a thick, rich cream to get results, because you don't, it's all about what's in it and this lightweight one sure does pack a punch. Whilst it's not my favourite from the brand, I can only be honest with you guys, (the bee venom serum is still right up there) I can certainly notice some results. Not so much with my lines and wrinkles but more that my complexion is brighter and certainly clearer. I think though with any product, to see good results you've got to be using it long term for the active ingredients to 'kick in' and get to work deep down. Well, from the age of twenty collagen production starts to decrease and it's collagen that keeps our skin firm and supple. I wish I knew more in my twenties and had the internet to help guide me to what products I needed but I'm doing my best now, hitting it with some powerful ingredients, so I hope to see some good results! I would say anyone mid to late twenties should be using serums and anything that will help boost collagen, it's never too early to start! 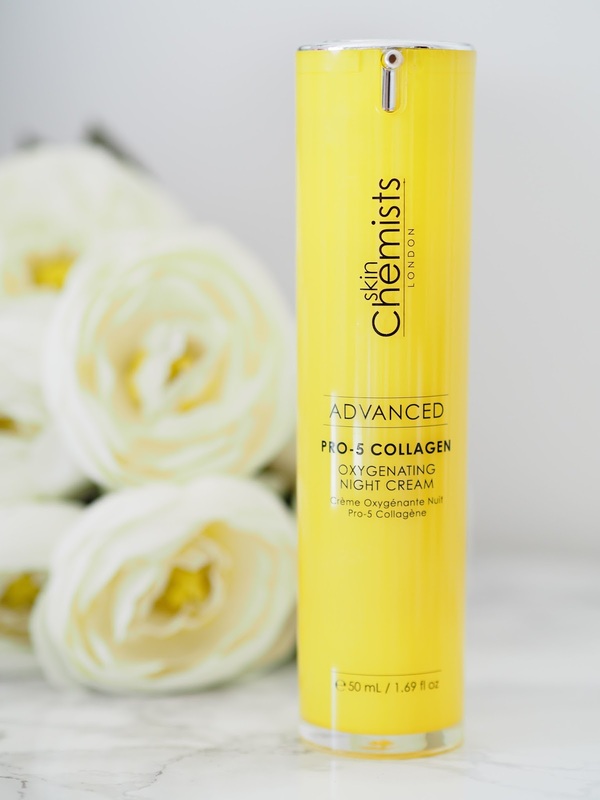 If you're interested in trying the Advanced Pro-5 collagen oxygenating night cream for yourself you can use the discount code PRICELESSBLOG at the checkout and get it for the amazing price of £19.99 until the end of April.